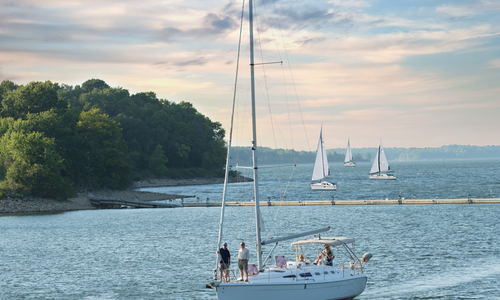 In Southwest Missouri, there’s outdoor splendor with every season—you just need to know where to look. For activity with a side of aesthetics, check out hikes and sights from a couple of local hiking pros. By Jeff RosePedestal Rocks Loop Trail offers lush views in summer and stunning rock formations in winter. 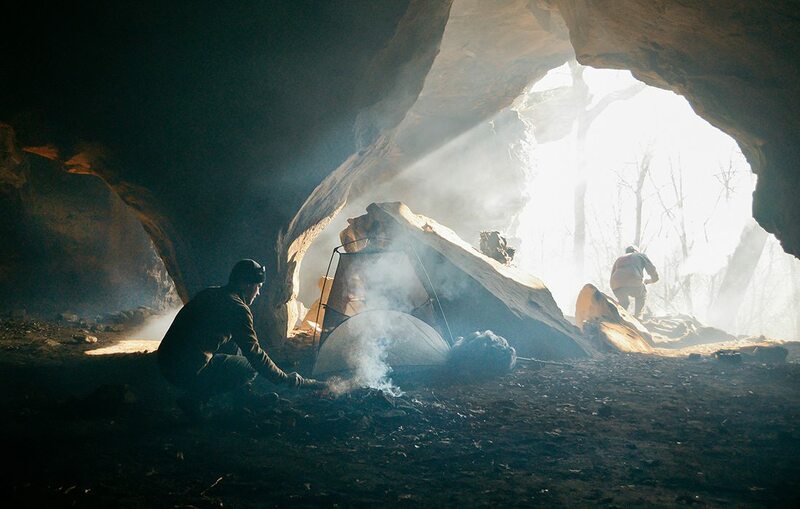 Trail Overview: Danny Collins, Founder and Guide of 37 North Expeditions, recommends this trail for its multiple viewpoints. It leads you through dense woodlands for views of open dolomite glades, springs and streams and a 1930s lookout tower that was constructed by the Civilian Conservation Corps. Winter Benefits: When the leaves are off, views of and near the tower are on-point. You can see more landscape through the open timbers. Summer Benefits: Warm weather brings this area an abundance of natural beauty in the form of forestry—a dense setting helps hikers feel a world away from reality. The end of the hike edges the river, which is a welcome sight on a warm day. Trail Overview: Brandi Keltner, a 417-land photographer who is well versed in the Ozarks outdoors, enjoys the versatility of the multiple trails at Two Rivers Bike Park. The West Loop is the longest in the system, and its terrain provides a healthy workout. 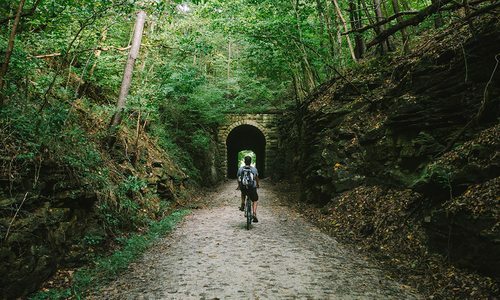 Winter Benefits: During the winter there are fewer bikers on this single-track trail, and the lighter traffic provides a more leisurely approach. Summer Benefits: The length and layout of this trail provide a variety of terrain, including multiple climbs, ascents and even log crossings on alternating rock and dirt terrain. When it’s dry in the summer, hikers don’t have to worry about slippery or muddy surfaces. By Jeff RoseWintertime is conducive to snuggling in for a Netflix binge, but if cabin fever is getting the best of you, hit the parks. Plenty of trails, like Pedestal Rocks Loop Trail, offer unbeatable benefits this time of year. 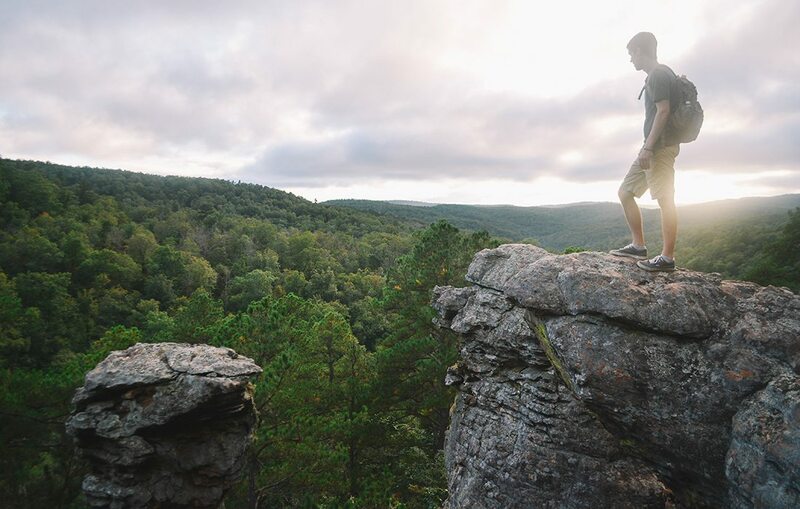 Trail Overview: Heavily peppered with towering one-of-a-kind rock formations, this Arkansas trail is well worth the drive from 417-land. Winter Benefits: Collins says the limestone rock formations are best seen in the winter when the vegetation around them has died off for the season. Hikers will see towering rocks balanced and stacked in ways they’ve never seen before. 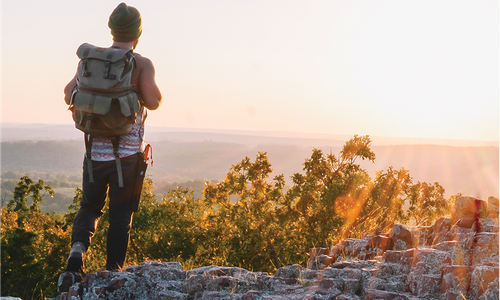 Summer Benefits: Since the Pedestal Rocks Loop Trail follows steep cliff lines, hikers take in breathtaking views of the surrounding Ozarks landscape. The summer months also offer a great time to check out the trail’s twin falls—17- and 19-foot waterfalls that are fed by wet-weather creeks. Trail Overview: This popular Branson trail in the Ruth and Paul Henning Conservation Area affords hikers views of small creeks and plentiful forest features. Winter Benefits: Just before the cold hits, the Homestead Trail is at its peak—leaf peepers looking for color come here for some of the best autumn views in southwest Missouri. The trail is also scenic after a fresh snowfall. Summer Benefits: Collins notes that this is a great trail to meander after a heavy rainfall—the small creeks overflow and dot the path with hidden waterfalls, and you’re always within earshot of running water.